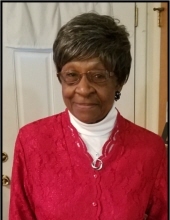 Mrs. Annie Cook Gregory entered eternal rest at Heritage Hall Nursing Home in Blackstone, VA on Monday, September 24, 2018. Daughter of the late Early and Willia B. Cook, she was born on December 9, 1931 in Charlotte Courthouse, VA. She was preceded in death by her parents, ten brothers and six sister. Mrs. Gregory married to the late Mr. Wesley Gregory Sr. on October 25, 1952 and they were married for 64 years until his death in 2017. They were blessed with seven children. She was a loving and devoted mother, grandmother, great-grandmother, sister, aunt and friend. She was preceded in death by her husband, the late Mr. Wesley Gregory Sr. She leaves to cherish her memories: her loving and devoted children Cora Robertson (Roy) of Richmond, VA, Hilda Gregory of Chesterfield, VA, Wesley Gregory, Jr. of Richmond, VA, Darlene Crawley (Troy) of Dinwiddie, VA, Alfreda Gregory of Durham, NC, Nicholas Gregory of Blackstone, VA and Melissa Gregory of Richmond, VA; two loving grandchildren, Charia Williams (Rashad) and Tyree Crawley; three great grandchildren, Nevaya Williams, Rashad Williams, Jr. and Malini Crawley; two sisters, Grace Stovall of Drakes Branch, VA and Lillian Easley of Baltimore, MD; two brothers, Early Cook, Jr. of Charlotte Courthouse, VA and John Cook (Charbeth) of Columbus, OH; sister-in-law, Geraldine Cook of Keysville, VA; and many nieces, nephews and friends. To plant a tree in memory of Annie Cook Gregory, please visit our Tribute Store. "Email Address" would like to share the life celebration of Annie Cook Gregory. Click on the "link" to go to share a favorite memory or leave a condolence message for the family.